It hasn't been the easiest of journeys to create something that's not tacky or inferior to the traditional album and which instead compliments it, but I think what we now have is beautiful. It's just like a book. 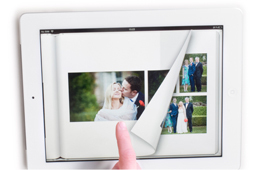 You can view the pages individually or side-by-side as spreads - as they appear in our normal albums. High Resolution: Each digital album page is beautifully presented in high resolution. It's optimized for the latest iPad and even looks great on the iPhone. I particularly love the ability to zoom in to see smaller images in more detail. Try doing that with a normal album! Anyone actually remember what a magnifying glass is? Share it: It's easy and it costs nothing. Send the album file to your relatives and friends to install on their own devices. Parents love it.